Thanksgiving is almost here. 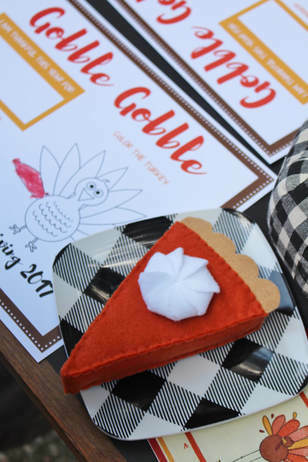 I have partnered with some amazing bloggers for holiday inspiration and FREE Thanksgiving printables. Be sure to check out all of the amazing goodies at the end of this post!! Some of the things that I love about Thanksgiving include the opportunity to slow down and focus on what matters most, to prepare and share food with those that I love, and to focus on the needs of friends, family and neighbors. For Thanksgiving, we typically prepare all of the main course items at our home, while grandma brings over an appetizer and the pies. In our household, we are definitely divided when it comes to which type of pie to bring; ½ prefer our family’s pumpkin pie recipe (which originated from my father’s side), and the other ½ prefers pecan pie. So, grandma brings both! It works out perfectly, as I prefer to cook and my mom prefers to bake! 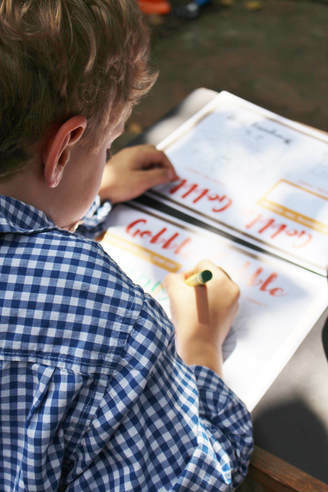 In some years, it is just our immediate family celebrating the holiday, while others we invite neighbors and friends to enjoy in our traditions. In our book, anyone is welcome to celebrate with us. With 4 small children in our household, it is important to consider their needs when decorating the table. 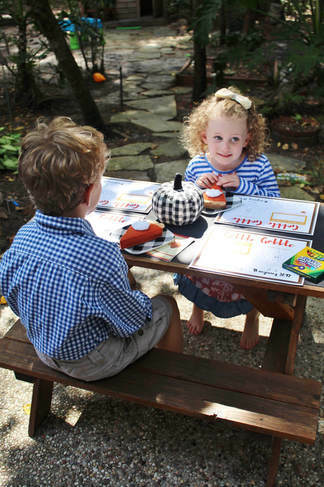 Since they know that mommy’s job is to make tables look pretty, they definitely expect nothing less when it comes to the kiddo table. To make things festive, yet appropriate for their needs, I covered a little picnic table using a black chalkboard paper runner. 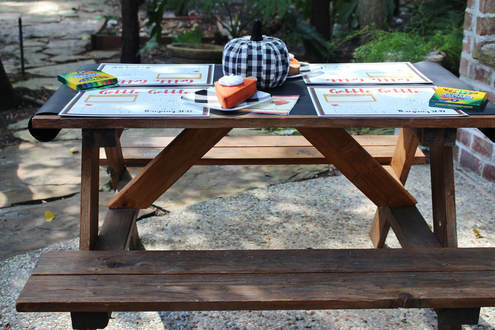 As a fun, yet affordable centerpiece, I chose this fun gingham pumpkin I sourced at Target. 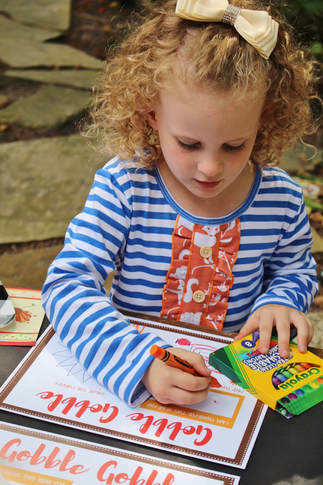 To add a décor element and a fun activity to keep their attention during dinner, we added these coloring placemats at each setting. 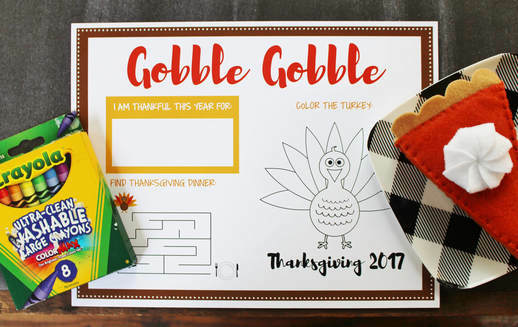 You can download your FREE printable coloring placemat below for your own holiday table. 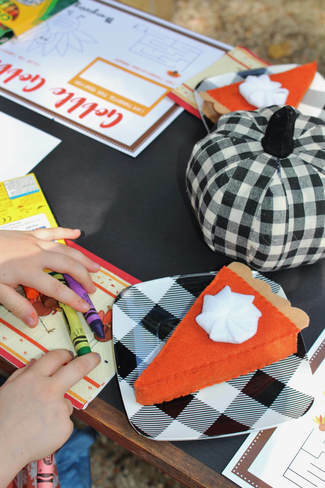 And to make things fun and whimsical, we added fun felt pumpkin pies for each guest. I mean….I can’t even get over the cuteness of these little goodies. Happy Thanksgiving from our family to yours! 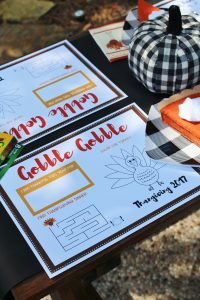 Be sure to peak at all of the amazing FREE printables from some of my favorite bloggers at the end of this post! 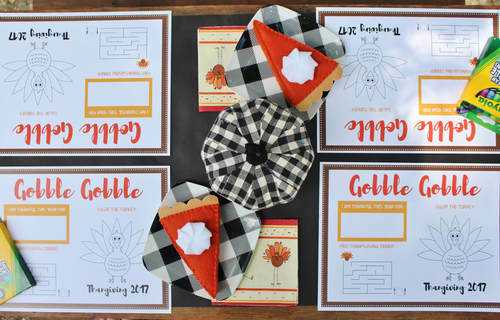 Gingham Pumpkin & Plates: TargetBe sure to hop over to these other 9 amazing bloggers for more FREE Thanksgiving printables! !